Good afternoon Blues and welcome to Thursday’s edition of Chelsea Fresh – where we take a look at the latest Chelsea news, transfer rumours and anything else surrounding the Stamford Bridge club. 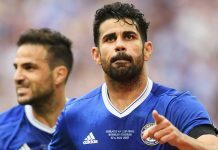 With the return of a much needed Premier League game to get back on track with, there are once again reports of severe unrest amongst some of the Chelsea players. A handful of players have come out in support of Manager Jose Mourinho, but there is still suspicions that many players are unhappy with the Manager for various reasons. The London Evening Standard claim that Mourinho has a ‘mutiny’ on his hands, with Cesar Azpilicueta, Nemanja Matic and Oscar all receiving the wrath of the backlash for Mourinho’s frustrations recently. ‘The Standard’ suggest that Moruinho’s ways, media handling and the Physio saga are all factors of growing frustrations from some players, despite Cesc Fabregas, Gary Cahill and Kurt Zouma all coming out and publicly backing the Manager recently. Fabregas continues his positivity in his latest interview with The Sun. He was quick to defend his sides chances this season despite the realistic gloomy outlook after a shocking start to the season. Cesc said “It is a very strange situation for Chelsea to be at the wrong end of the table. And, for most of us at the club, it is the first time we have ever been down there. We are dealing with our problems on the training ground as a group. We must work harder, plan better and compete better than we have. The 25 players, the manager and the coaching staff will work together to sort it. No one else will do us any favours”. He finished off “I still believe we can win the league. It’s not going to be easy but a 10-point gap at this stage of the season is not impossible. Last season we took 22 points from our first eight games but this time every team has lost at least one”. Cesc also said that Jose Mourinho is the best Manager around and that there was nobody else better than him that can turn it around. Well, with Fabregas being one of the worst performers so far this season, let’s hope he takes this positive fight to the pitch against Aston Villa this weekend and get his individual game back to standard.